Seventeen endangered sea turtles rescued last autumn off of Cape Cod due to hypothermia have completed their rehabilitation at the New England Aquarium and were released Sunday evening near the southern tip of the Delmarva Peninsula in Virginia. Water temperatures along the Virginia coast range from the low to mid 70’s while the warmest in Massachusetts have just cracked 60 degrees–still too cold for these turtles! Since the sea turtles are ready to go, but the local waters are not ready for them, New England Aquarium staff left Quincy, MA very early Sunday morning and drive fifteen Kemp’s ridley sea turtles and two loggerheads ten hours south to more hospitable waters about an hour north of Virginia Beach. There with the assistance of staff from the Virginia Aquarium and Marine Science Center, those turtles will be placed in the sand just above the surf where the smell of the open ocean will fill their nostrils, and their flippers will hastily propel them into the water and a return to their home. Juggernaut at his first medical exam near death last December. Note how beat up his shell is. The largest among them is an 80 pound loggerhead turtle named Juggernaut. It stranded last December 11 on Skaket Beach in Orleans on Cape Cod weighing much less. The nearly motionless orange-brownish turtle was found by staff and volunteers of the Mass Audubon Wellfleet Bay Wildlife Sanctuary and transported to the New England Aquarium’s Marine Animal Care Center just south of Boston. This older juvenile turtle had an unusual fracture on the lower shell surrounding its rear flippers. The injury might have kept it from migrating earlier in the autumn. Because of the water temperature, Juggernaut’s immediate life threatening medical problems were hypothermia, dehydration and malnutrition. 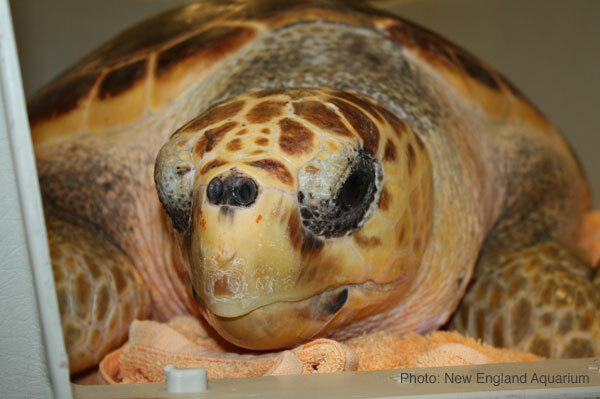 After six months of rehabilitation, Juggernaut is now ready to go along with 16 other sea turtles. Most of the other soon to be released turtles are juvenile Kemp’s ridleys which are the most endangered sea turtle in the world and also the smallest. They were the sea turtle species most affected by the Gulf oil spill. The New England Aquarium has rehabilitated and released nearly a thousand sea turtles over the last 25 years and has made a significant contribution to the slow recovery of the critically endangered Kemp’s ridley sea turtle population. Check out all the media coverage of the happy event! And for a special piece about a dedicated member of our rescue team, check out this article in the Worcester Telegram. Be sure to keep track of the Rescue Blog for a fist hand perspective on the event. The rescue team is on their way back from Virginia right now and they'll be weighing in very soon! 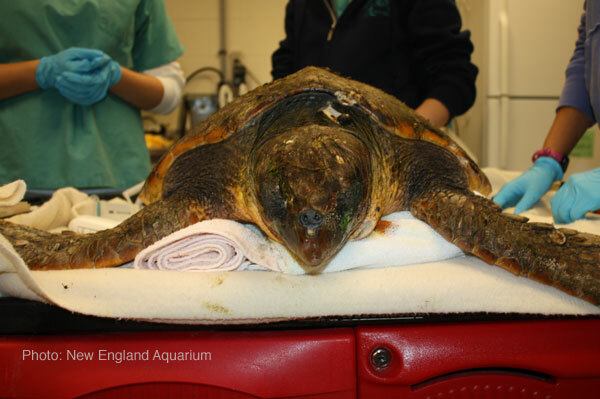 In the meantime, learn more about the Aquarium's sea turtle rescue program. And here's a good idea of what a day in the midst of sea turtle rescue season is like.